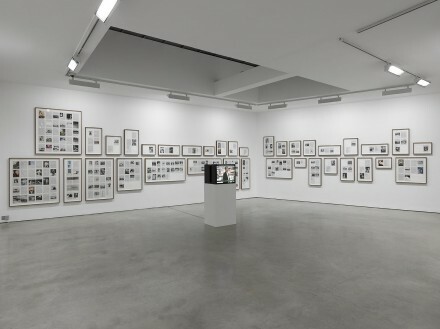 Cross Section of a Revolution, on view at Lisson Gallery in London, brings together seven artists and pairs of artists whose work explores questions of trade, contested territory and trauma in a global context. These substantial themes are approached through a variety of mediums that speak to both individual and collective experiences in Central Asia, Pakistan, Kenya, Europe and the United States,opening lines of inquiry into aspects of cultural and political fragmentation, and reveals strategies for art and aesthetics in relation to cultural, geographic and religious division. This group exhibition does not shy away from inspiring or explicitly asking large questions about the nature of globalization and aesthetics. For instance: how is a modern understanding of culture, politics, and religion shaped or impacted by a continual flow of visual information? 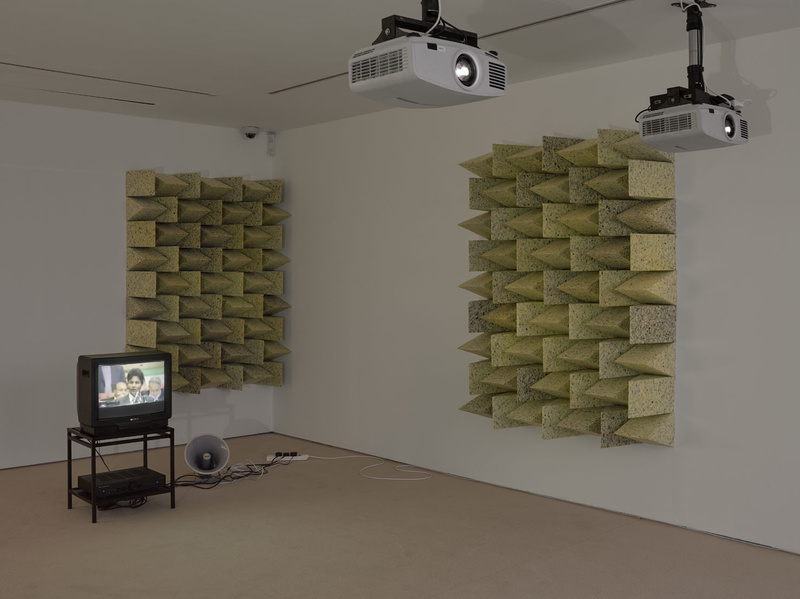 The titular work by British artist Haroon Mirza places two videos in conversation. In one video, the rhythmic drumming of a Muslim wedding in Kenya resounds, a suggestion of ritual and ceremony set against appropriated YouTube footage of a Lahore student competition for speech in the language of Urdu. This confusion of sounds reflects the confusion of aesthetic and cross-cultural interpretation, while referencing the immediacy of translation that sound carries beyond the conveyance of knowledge and understanding. 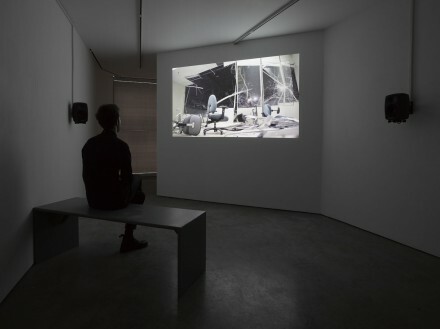 Artist duos Broomberg & Chanarin and Allora & Calzadilla approach themes of power and catastrophe in their works Divine Violence (2013) and The Bell, The Digger, and the Tropical Pharmacy (2013). 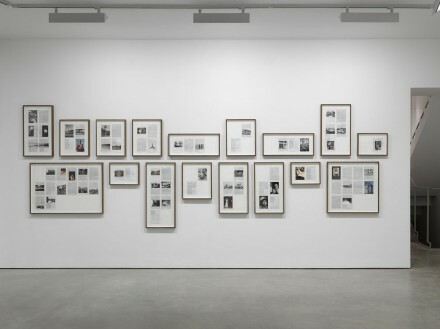 In the former, the modified and heavily annotated text of a King James Bible is interspersed with photographs from the Archive of Modern Conflict, reflecting on the relationship between divinity and atrocity, while in The Bell, The Digger, and the Tropical Pharmacy, the footage of the demolition of an industrial building in Puerto Rico by a cast-iron church bell (rather than a wrecking ball) is punctuated by the impressive sound of the bell smashing through the walls of the factory. Both pieces suggest the catharsis involved in destruction and the element of wreckage involved in the dream of progress. At a fundamental level, the chorus of voices in this show speaks about difference as propagated, sold, and circulated through a global economy of aesthetic relationships. The level of diversity of subjects and media in this show is a bit dizzying, but ultimately does not at all detract from the powerful suggestion of exchange across borders, territories, religions and even histories that pervades. Further, the show represents an exciting and important turn towards the potential for creating dialogue, correspondence and conversation on visual terms. The impact of these works obliges the spectator to go beyond an aesthetic experience of space, any one of which, presented here, merit more profound historical and cultural investigation. 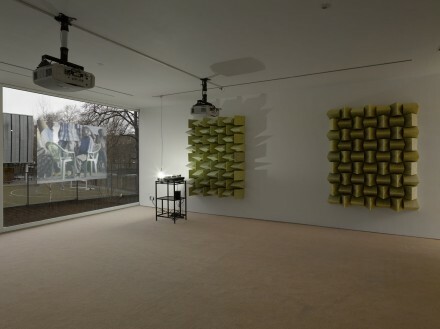 However, a clear coherence between these projects still manages to leave one with the impression of entering into a series of conversations that echo and react to each other, often in real time. Cross Section of a Revolution is on view through March 7, 2015 at the Lisson Gallery in London. This entry was posted on Wednesday, February 25th, 2015 at 12:00 am	and is filed under Art News, Featured Post, Show. You can follow any responses to this entry through the RSS 2.0 feed. You can leave a response, or trackback from your own site.